A list of references is included at page bottom. A complete bibliography can be found on this separate webpage: "Literature". One holds the breath and it is collected together. If it is collected it expands. When it expands it goes down. When it goes down it becomes quiet. When is becomes quiet it will solidify. When it becomes solidifed it will begin to sprout. After it has sprouted it will grow. As it grows it will be pulled back again (to the upper regions). When it has been pulled back it will reach the crown of the head. Above, it will press against the crown of the head. Below it will press downwards. Whoever follows this will live; whoever acts contrary to it will die." as early as the middle of the -6th century." "There are the six ch'i of Heaven. they proclaim themselves in the five notes." one need think no more about the basket. one need think no more about the trap. one need no longer think about the words. If only I could find someone who has stopped thinking about words and could have him with me to talk to!" Trsl. by Fung Yu-lan, 1948, 1968. "The fish trap exists because of the fish; once you've gotten the fish, you can forget the trap. The rabbit snare exists because of the rabbit; once you've gotten the rabbit, you can forget the snare. Where can I find a man who has forgotten words so I can have a word with him?" 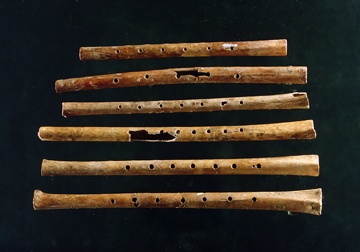 " Anciently, Huang Ti ordered Ling Lun to make pitch-pipes. So Ling Lun, passing through Ta-Hsia towards the west, travelled to the northern slopes of the Juan-yü mountains, and there in the valley of Hsieh-ch'i found bamboos with stems of which the hollow (part) and the thickness (of the walls) were uniform. Cutting one between the the nodes to a length of 3:9 in., he blew it, and took its fundamental note [kung] to be that of the Huang-chung tube. Blowing again, he said, 'This is good enough', and proceeded to make all the twelve pipes [t'ung]. Then at the foot of the Juan-yü mountain, he listened to the singing of the male and female phoenix and divided the pitch-pipes accordingly (into two groups), the male notes making six and the female also six. 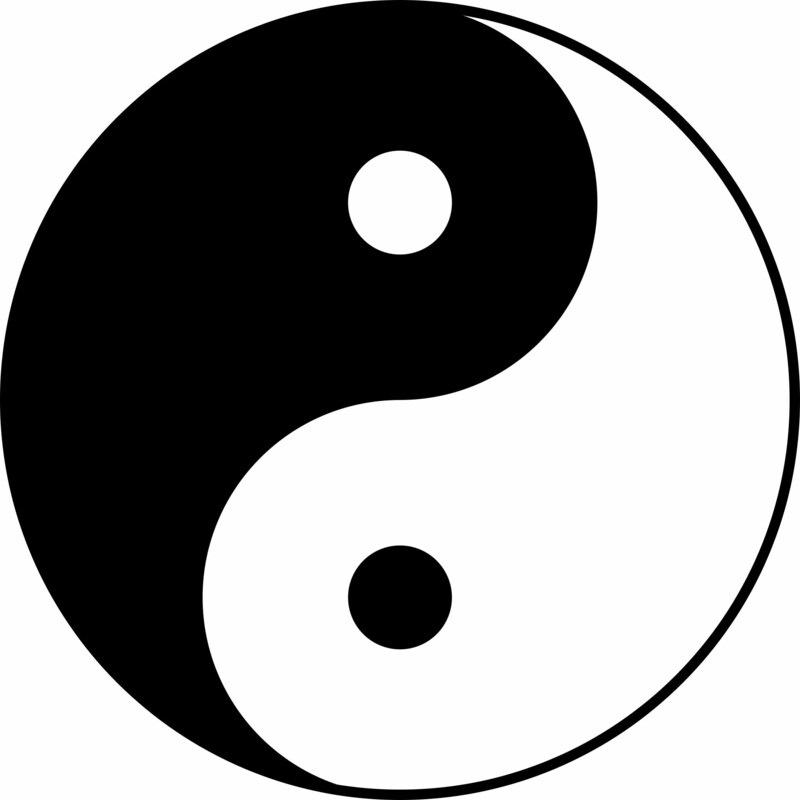 In order to bring them together, the Huang-chung fundamental harmonised them. Indeed the Huang-chung fundamental [kung] is capable of generating the entire (series). 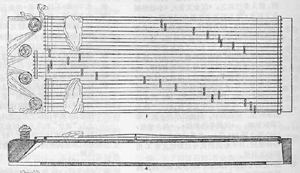 Therefore it is said that the Huang-chung fundamental is the source and root of the male and female pitch-pipes [lü-lü]. 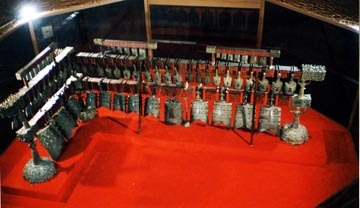 (Upon his return) Ling Lun, together with Jung Chiang, was ordered by Huang Ti to cast twelve bells in order to harmonise the five notes, so that splendid music might be made. - - - "
Quoted from the Lü Shih Ch'un Ch'iu, 239 BCE, by Lü-pu-wei, n.d.
"Try tuning musical instruments such as the ch'in or the se. The kung note or the shang note struck upon one lute will be answered by the kung or the shang notes from other stringed instruments. They sound by themselves. This is nothing miraculous, but the Five Notes being in relation; they are what they are according to the numbers (whereby the world is constructed)." 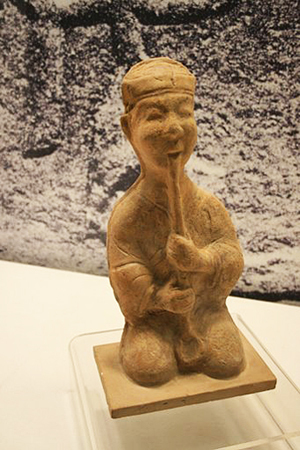 Tung Chung-shu, 2nd century BCE Trsl. by Joseph Needham, 1962. Date: c. 180 BCE (Western Han Period). "When the human world is well governed and the people are at peace, when the will (of the ruler) is equable and his character correct, then the transforming (influences) of Heaven and Earth operate in a perfect manner, and among the ten thousand things only the finest are produced. But when the human world is in disorder and the people become perverse, or when the will (of the ruler) is depraved and his character rebellious, then (their) ch'i opposes the transforming (influences) of Heaven and Earth, harming the ch'i (of Yin and Yang) and so generating calamities and disasters." Tung Chung-shu, 2nd century BCE, in the Ch'un Ch'iu Fan Lu.
" --- When numbers assume form, they realise themselves in musical sound." "In determining the pitch of bells in antiquity they levelled off their notes by ear. After that when they could go no further they availed themselves of numbers and thereby made their measurements correct. If the figures of the measurements are correct the notes will also be correct." Ts'ai Yung, 133-192 CE, commenting on the Yüeh Ling.
" (The opening bars of a lute melody are) strong like lofty mountains, or again they resemble heaving waves: broad and generous, majestic and imposing. Then the tones become more irregular, halting as if in sorrow, and dragging on like rustling garments. Then again the melody expands, tones rise as bubbling waves, they open up like blossoming flowers. Having understood the style of the melody, one must observe the rhythm, correctly reproducing the various transitions in tempo, but keeping the right measure. One must shun specious effects, and concentrate on one's play, abiding by the rules, playing on quietly. Then the tones shall be imposing and expressive, they spread out, vastly expansive. Distinctly and clearly they end, and finally the coda in 'floating tones' echoes faintly the main motif of the melody." Trsl. by R.H. van Gulik, 1941, 1969. "The ch'i associated with wind being correct, the ch'i for each of the twelve months (causes) a sympathetic reaction [ying] (in the pitch-pipes); the pitch-pipes (related serially to the months) never go astray in their serial order." Ch'en Tsan, 4th century CE, commenting on the Ch'ien Han Shu. "Above every enemy in battle there exists a vapour-colour [ch'i-se]. If the ch'i is strong, the sound (note) is strong. If the note is strong, his host is unyielding. The pitch-pipe is (the instrument) by which one canalizes (or communicates with) ch'i, and thus may foreknow good or evil fortune." Ping Shu, 'Book of War', now lost. Trsl. by Joseph Needham, 1962. Schuyler van R. Cammann: 'Types of Symbols in Chinese Art'. Vol. 55, No. 55, Part 2, 1953. Edmund Capon and William MacQuitty: Princes of Jade. Cheng Te-k'un: 'Yin-Yang Wu-hsing and Han Art'. In: Harvard Journal of Asian Studies 20, 1-2, 1957. Fung Yu-lan: A Short History of Chinese Philosophy. R.H. van Gulik: Hsi K'ang and his Poetical Essay on the Lute. K'ao Ku (Chinese periodical of archaeology) 1974, Vol. 1. K'ao Ku Publishing Co., Beijing, February 1974. James Legge: The Texts of Taoism. Oxford, 1891. Julian Press, New York, 1961. Joseph Needham: Science and Civilisation in China, Vol. 4. Physics and Physical Technology: Sound (Acoustics). Cambridge At the University Press, Cambridge, 1962. William Watson: China. William Watson, London, 1961. China at the Royal Academy, London, Sept. 29, 1973, to Jan. 23, 1974. Times Newspapers Ltd., London, 1973.
about the excavations at Ma-wang-tui, Ch'ang-sha, Hunan. Wen Wu Publishing Co., Beijing, July 1972.